I got A2 (2200 words) on the first test and 4910 (last 46.33%, like an 8 year old child) on the second. My feeling is that the first test is a more accurate gauge, at least for me. I made a lot of educated guesses on the second one. I'd be very happy to have the vocabulary of an 8 year old Turkish kid; my actual level is probably lower than that, and A2 seems about right. Last edited by eskandar on 2018-04-29, 5:34, edited 2 times in total. eskandar wrote: I got A2 (2200 words) on the first test and 4910 (last 46.33%, like an 8 year old child) on the second. My feeling is that the first test is a more accurate gauge, at least for me. I made a lot of educated guesses on the second one. I'd be very happy to have the vocabulary of an 8 year old Turkish kid; my actual level is probably lower than that, and A2 seems about right. Oh well, I didn't really believe the "B2" result that I got from the first test and that's why I wanted to find if there's a different test. The word counts are kind of problematic, after all: rahat, rahatsız, rahatsızlık, etc -- are they all different words or just variants of the same word? I don't really think I'm anywhere close to overall B2. Only the reading is getting close to it, other skills are much lower, and I might even be A0 in speaking. Then again, maybe the first one is not so great, either. I just took a handful of other language placement exams on the first site and quickly noticed that they all use the exact same English vocabulary. They have one set of English words (assigned varying levels of commonness or difficulty, I guess) and then they translate the same list for each language. Not a very good method; each language needs its own unique frequency list. It's not that I expected some online quiz to be particularly accurate, but this one-size-fits-all approach seems especially lazy. Just reporting that I'm alive. I was pretty sick during the first half of this week, and even doing ~100 reviews was hard enough when my brain is not functioning. The reason the Phase 3 doesn't have a set date was to give myself control when to end the phase. Given that almost 1.5 month passed and I'm not even halfway there, I'm starting to think that maybe I bit more than I could chew. Let's see how this goes for a little longer. Some observations at this point. 1. Anki cards are harder to read than novels. Yes, because in novels, even if there are a lot of words that I do not understand, so long as I can follow the general story, I do not force myself. Novels also provide a lot more context around; even as I try to make the Anki cards contain meaningful contexts in themselves, this is still not a natural way people read. Further, the expectation with the Anki cards is that I know the damn words that I see on the cards. 2. While I do learn new words from just reading, the pace is pretty slow. French loanwords or new patterns of derivational morphology from known roots are easier and they get added to the passive vocabulary, but that's about it. 3. I am reading extended Turkish more fluently than before, but fluently as in the ease of the reading process, not necessarily the overall comprehension. The known words and familiar constructions are understood as they are, as if I'm reading a language that I already know at an advanced level, and while that is important, the percentage of the known words could definitely see a few more points. I was thinking about this for the past week, if I want to just press into reading blindly and see if the quantity prevails, or not. I know this is possible, that I have more than enough vocabulary already to force this and reach native-level comprehension. After all, that's how I learned English and Japanese. It somehow happened. However, that's going to require much longer time and efforts. I'm not looking at 4k or 40k pages of texts (and the equivalent spoken media), but a figure with maybe one more zero at the end if I were to try that route. To learn efficiently, I need to maximize the marginal utility. I am able to process Turkish much faster after having read 1605 pages of text, and that has helped the listening comprehension tremendously as well. But I'm seeing the diminishing marginal utility of one more page. That is, know roughly 3k more words. This is just my hope that the extra 3k words will tip the balance so that I know the language well enough to understand 90% of any given non-technical text. The other remaining 10% will of course be the hardest part to acquire, but a step at a time. As for the reading goals, I'll modify it slightly: Read 4,000 pages, the original amount I had at the beginning of the Phase 3. If the reading goal goes up to 7k as well, that may delay the final phrase of the experiment a little too much. Another major reason for this change of plan is that -- I just wasn't feeling like I was progressing enough. When the numbers go up slowly, that does affect the subjective sense of progress. And that in turn affects your motivation, which I must admit has been dropping recently. Anki: Hadi, zaman gelmişti. Devam etmelim. Anki: Sadece biraz oynayıp eğlenelim, merak etme. Ayrıca, oynamak zorundasın -- senin için başka bir seçenek yok. Unutma, bu desteyi yapan biri sensin. Long time no update from you! How is it going? It's been a long time. A little more than three months, about 100 days more or less. Now, what happened? A lot. A lot of things are still happening, I was very distracted by the changes in my circumstances. I am working on a different project than I used to. Since it's a very different kind of work, I had to be more focused at work and the new project doesn't allow streaming YouTube (for good reasons, actually). My shift schedules changed multiple times, and on top of all that I've been busy looking for a new apartment as well. I haven't moved yet, but I will soon. In short, I did have time, but not much energy and was under a lot of stress. Well, at least I make more money than before. Back to Turkish. 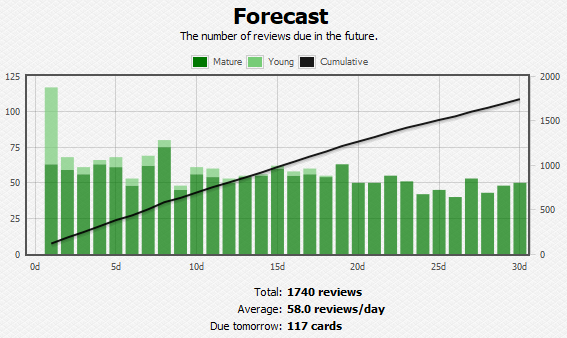 Anki reviews have been piling up and by this point it's probably OK to say it's beyond repair. Have I fucked up and annulled all my progress? Let's see. I want to spend a few days re-assessing my situation and see what kind of rehabilitation could get me back on track. Welcome back, Karavinka! I'm curious to see how you're going to get back on track. Perhaps the easiest (but not necessarily the most effective) way is to reset the deck and re-start from scratch? I would start again from scratch, but I'm the kind of person who regularly suspends cards (a bit less now that I only due recognition stuff with sentences, but still). Anki helps because of the regularity, not the specific cards, IMO. In fact, given the massive amount of cards you've reviewed it probably wouldn't be bad for you to prune your deck a bit. If there are some specific cards in the deck you really want to review you can just move them over into a new deck, and then either suspend or export the rest. Either way I'm looking forward to see how you get back into it.